Moroccan Minimalism! The Mogador Bronze are a new finish-version of the traditional style Moroccan lanterns that are found all over the Ryads in Marrakesh. 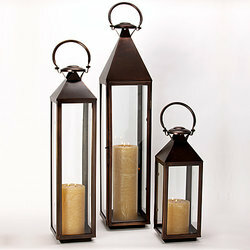 They are great to light the entrance, the yard, or simply cluster around the pool, at sunset. This lantern style is a South Beach favorite and can be seen all over at The Shore Club.